It was not the first time for Felix and Fingers to perform at the Brookfield Zoo, and as tempting as it may have been to title this ‘Felix and Fingers… and Feathers’ I had to give credit to the presentation that really awed the audience, and left the bride in tears of joy. There is certainly no discredit to the beautiful peacock who faithfully stood by car while I unpacked my gear. I appreciate him taking guard for me. However, I have to talk about an amazing highlight of the night. I didn’t fully understand how important Broadway musicals were to the bride until I had more time to talk with her after the wedding. Let me get this out of the way and toot my own horn, by saying that she loved our show. And in fact (after the show) she and her new husband and others congratulated Mike and I. They were so thankful and appreciative. It’s always a nice feeling to get such compliments. Then the bride began talking about Broadway with me. And while we didn’t really talk about the flash mob presentation, it was then that the full impact of what occurred earlier during the speeches hit me. What? All This At The Brookfield Zoo? Yes. This happened at the zoo. You might be wondering if the venue smelled of animals and manure. Absolutely not. This place was spotless. And the air was a beautiful autumn breeze (although a tad bit chilly for this early in the season.) It was a beautiful wedding venue. We performed in the Swan Pavilion. I don’t even know if the newlyweds had any special love for animals which inspired them to have their wedding at the zoo, or if they were just “in the know” as to what a wonderful venue the Brookfield Zoo provided. Whatever the answer to that may be, the Brookfield Zoo has a wonderful venue for ANYONE who is getting married. Be sure to check out the website of Type A Images, to see their professional pictures of the wedding. The Zoo Was Great, The Singing Was Fantastic, But Can White Men Dance? By now, you’ve realized that this was not your average wedding. From the venue selection to the flash mob presentation, it was full of surprises. But how about this one. 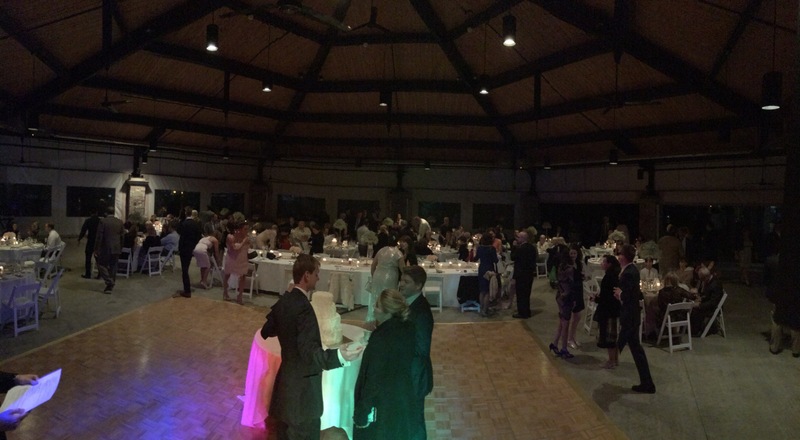 During our last dueling song, we had everyone gather together in the circle around the Bride and Groom. When suddenly, the groom started breakdancing. I don’t think I’ve seen moves like that since 1984. He was killing it! And by that I mean, this guy could really bust a move! Congratulations Mr. and Mrs. Strom! We were so happy to play for you. Both of you and your families were incredibly friendly. You actually grabbed me from my line of duty, and brought me in on an emotional level to experience the true happiness of your event, and we wish you the very best!